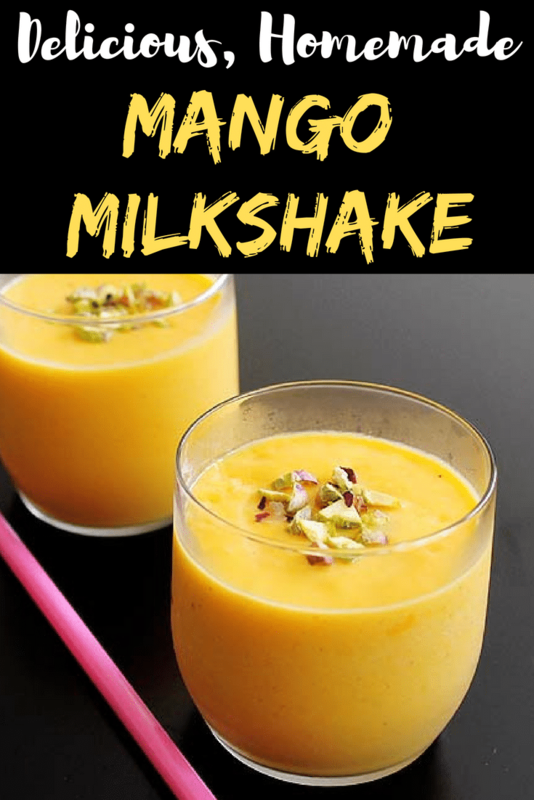 Mango Milkshake recipe – simple, easy milkshake recipe with mangoes. It is flavored with cardamom powder. Mango season is about to end. And this mango milkshake is my last mango recipe for this season. Monsoon is coming very soon. After the first rain, the taste of mango changes. I never liked this different taste of mango. I am not sure you have noticed or not. But after the first rain of the season, it tastes little weird. That is just my opinion. 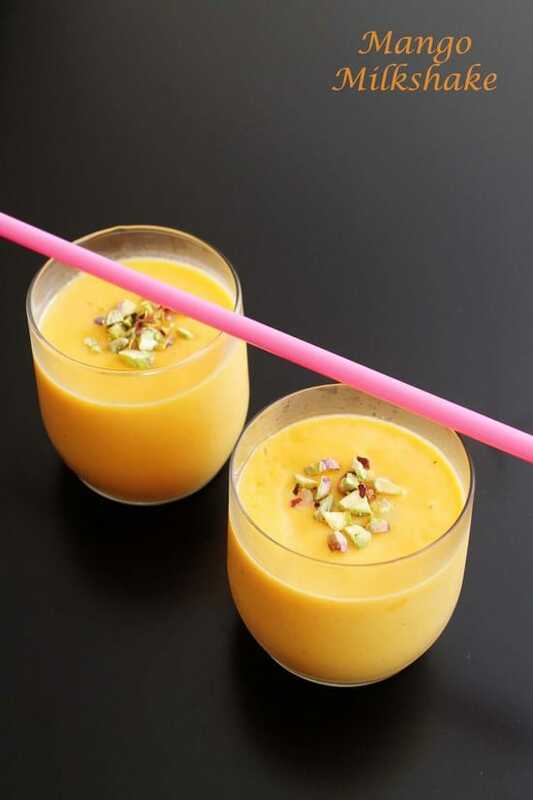 During summer, mango milkshake is most popular milkshake recipe in India. My mom makes it very often and I happily drink it in my summer vacation as a child. As being adult, I still like to drink this mango shake. I prefer to use non-fibrous variety of mangoes for milkshake. If fiber comes in mouth while drinking milkshake then it won’t feel good. also it won’t taste good. Always use good quality mangoes to get the best flavor of mangoes. 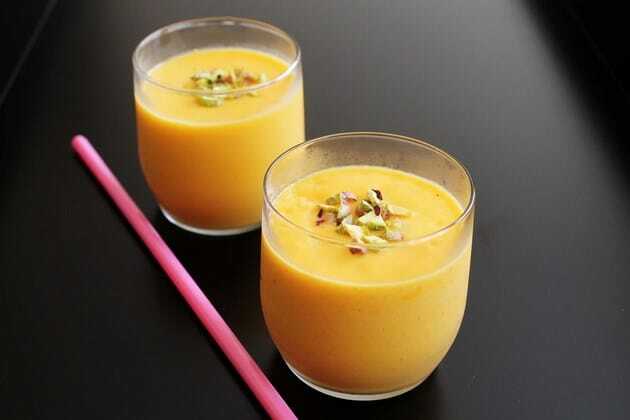 Always use chilled mango pieces to make mango shake. I usually keep my mangoes in the refrigerator. If your mango is at room temperature. Then chop it and freeze it for 15-20 minutes. If you don’t have time to chill the mangoes then add few ice cubes while blending the shake. I have added cardamom powder to my mango shake. But you can make it plain or you can add saffron instead. Here I have used fresh mangoes. But you can use canned mango pulp. If your mango pulp is already sweetened then skip the sugar in the recipe. There is another thick version of mango milkshake with ice cream and it is called Mango mastani. I have garnished it with some chopped pistachio nuts. You can use any nuts of your liking. Or skip the nuts and serve plain. In place of nuts, you can top it with vanilla ice cream or dollop of whipped cream. Take chopped mangoes and ¼ cup of milk in the blender. Blend it till it gets smooth. Add remaining milk, cardamom powder and sugar. Adjust the sugar quantity as per your mango’s sweetness. And again blend it till everything gets incorporated. Pour into the serving glass. Garnish with chopped pistachios or any nuts. And serve.